Preferred bidder status would not have happened if it was not for the fantastic support by the fans who were behind Pars United all the way. This would not have happened if it was not for the enthusiasm and dedication of our wonderful fans over the last 6 momths as well as all those companies and individuals named in the Roll of Honour. 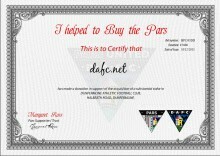 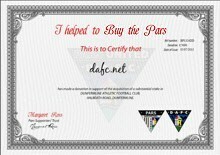 A second certificate has now been issued meaning that overall £10,000 has been raised and passed to Pars United.